"For as long as I can remember, life has been measured in seconds. The fewer, the better." Most people equate success with having more, but Sanya's quest was always for less. She started running track as a little girl in Jamaica and began competing when she was only seven. At 31 she's had a career's worth of conditioning to run a 400-meter race in 50 seconds, hopefully 49, or even better, 48. When she started training with her coach, Clyde Hart, they divided her race into four phases: push, pace, position, poise, and with the inherent prayer. For years Sanya worked to hone every phase in practice so that when it came time to race, her body would respond as her mind instinctively transitioned from one phase to the next. As she got older and embraced a life that measures more than just a number on the time clock, she has realized the genius of this strategy for not just racing the 400 meters, but for living her best life. 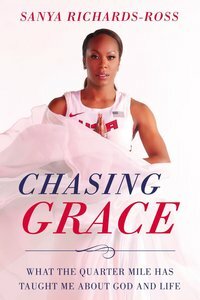 Sanya shares triumphant as well as heartbreaking stories as she reveals her journey to becoming a world-class runner.From her childhood in Jamaica to Athens, Beijing and London Olympics, readers will find themselves inspired by the unique insights she's gained through her victories and losses, including her devastating injury during the 2016 Olympic Trials forcing career retirement just weeks before Rio. Sanya demonstrates how even this devastating loss brought her closer to the ultimate goal of becoming all God created her to be. "Sometimes you think you are chasing a gold medal, but that's not what you are chasing. You're racing to become the best version of yourself."